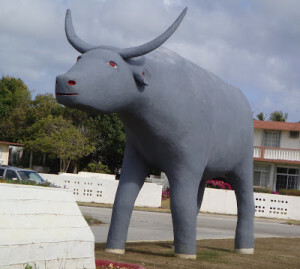 The locals have a saying, “only on Guam” (O.O.G. ), to describe certain behaviors, traditions or strange phenomena, events that seem to occur, either as mysterious, frequent, or unique to the island. 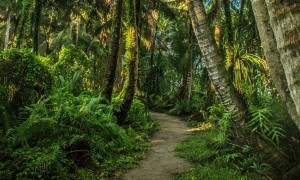 This article will include strange things locals do, what they have encountered, and what the world is saying about a supposedly tranquil, idyllic island that may even surprise long-time residents. Test your expertise about Guam and see if you can determine fact from fiction. 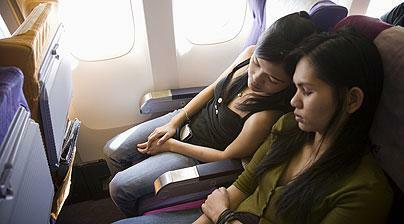 On this flight, headed to Guam were the members of a scientific research group called DHARMA. A mid-air disturbance occurred changing their course not only to a different island, but to a different space and time. This group’s general goal was to manipulate scientific laws in order to change any of the six factors of the Valenzetti Equation, a sequence that was believed to have some connection to the date marking the end of humanity, in hopes of delaying such a date. 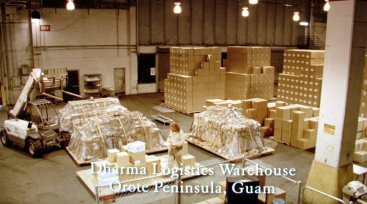 DHARMA has a stocking warehouse in Guam’s Orote Peninsula and this website. Did the website convince you? Scroll down for the answer. FACT: A time warp is not a fictitious idea, but a hypothetical change or distortion occurring in the flow of time that would move events from one time period to another. However, the story above is science fiction. The information was taken from a website created by fans of the TV show “Lost.” Orote Peninsula is located in Guam’s Naval Base. FICTION: The popular sci-fi TV show had a time-warp mythology arc, and the pilot episode mentioned Guam as the final destination of the fictional airliner Ajira Airways. The fictional Hydra Island is where the time warps took place. Guam is mentioned on another episode that shows, in white subtitles (picture above), the location of the DHARMA Logistics Warehouse in the Orote Peninsula. Traveling back in time is a concept in quantum mechanics describing the phenomenon of when a person moves back, in different points in time, the way a physical object moves in different points in space. Time travel is the process that occurs in a time warp. Travelers leaving Guam have often experienced losing hours-worth of time when flying towards the region of the south-western Pacific. Some who have left Guam on a Monday find themselves waking up on board a plane, landing in American Samoa on a Sunday — having to relive the day all over again. 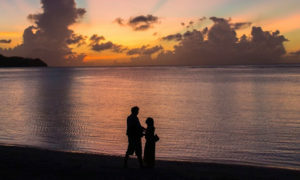 FACT: The tagline, “Guam is where America’s Day begins,” says it all. 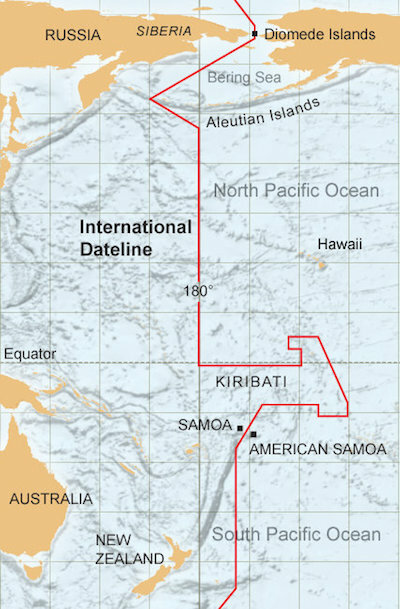 We’re a day ahead on the west side of the International Dateline and a day behind on the east where American Samoa is situated. So every single human being who has traveled crossing the International Dateline to the east side of the Pacific Ocean has technically traveled back in time. In school we were taught about the International Dateline, an imaginary line that runs through the middle of the Pacific Ocean on the 180° line of longitude, separating two sides and creating two consecutive calendar days. So when a person travels east across the International Dateline, a day (24 hours) is being subtracted. And when a person travels west across the International Dateline, a day (24 hours) will be added. What is stranger is that the dateline is not a perfectly straight line. It has been redrawn over the years at the request of certain countries. Ask an islander for directions and you will have no need for Google Earth, Mapquest, or your smartphone app because the route you will be given will feel like riddles to a treasure hunt. The locals often find that using landmarks and other non-descript areas is the most efficient way to finding streets or places. A local’s directions to Talofofo Bay: Coming from Barrigada, turn left at the Chalan Pago intersection in front of former Judge Manibusan’s house (on top of a ledge). Keep driving. You know you’re in the village of Yona when you pass by Bordallo’s Mansion at the top of the hill and after a half a mile away, the giant Carabao statue will be on the right. You’ll go down a curving hill that takes you through the Ilig Bridge currently undergoing construction. Keep going straight as you pass the Cross-Island Road to the left. On the right, is a cemetery by the beach. 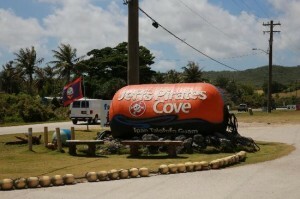 Keep going straight and Jeff’s Pirate’s Cove should be on your right. Follow that road until you go up a hill. Stop at the stop sign, and there should be an uphill road turning right. Don’t take that! Proceed to the road going downhill, on the left. As you drive downhill, you will see Talofofo Bay on your left. FACT: Not relying on street signs was, in part, put into practice when countless typhoons during the ’80s and ’90s ravaged the island one after another, causing street signs to either disappear (by being blown away), receive damages beyond repair, and for most, left unreadable after the pelting wind and rain peeled off the paint. Other than that, signs are not as picturesque as landmarks, and what better way to get people to appreciate the interesting details locals notice about their island while sending you to your destination? The volcanic sand is formed by iron-rich rock particles, which gives the sand its black, reddish-rust weathered appearance. What gives the sand in Talofofo Bay its distinctive green color is from the mineral called Olivine. 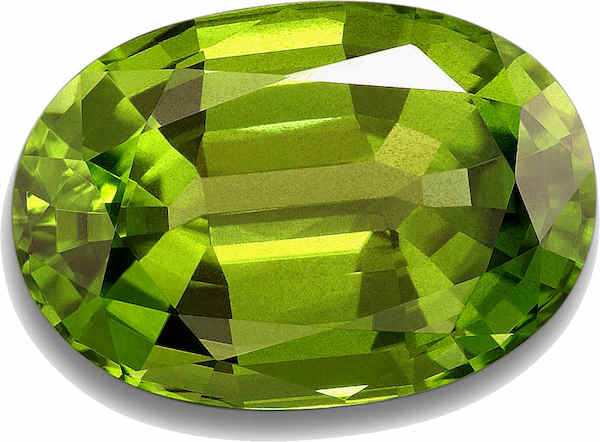 The mineral is one of Earth’s most abundant minerals by volume, but when it is found of gem quality it is known as Peridot. This gem is popularly known as the birthstone for the month of August. 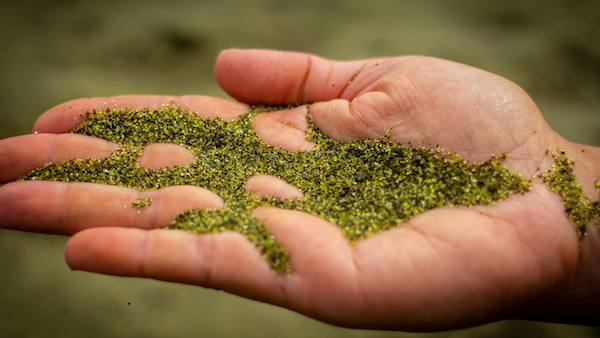 FACT: The other three green sand beaches are: Papakolea Beach in the island of Hawaii, Punta Cormorant on Floreana Island in the Galapagos Islands, and Hornindalysvatnet, Norway. The Talofofo beach sand received high concentrations of this mineral from deposits of eroding volcanic terrain in the southern part of the island. The intensity and tint of the green is determined by how much iron is contained in the crystal structure. 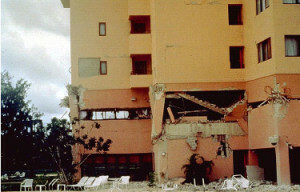 The 12th story apartment and hotel, Royal Palm Resort, was in operation for only one month when an 8.1 Earthquake struck Guam. Accustomed to earthquakes, the majority of local residents, with patience and calm, wait for the slight tremor of the Earth to pass then proceed on with their daily routine. Their nonchalant attitude towards earthquakes would forever change after one Sunday evening in August of 1992 when a 8.1 temblor rocked the island for two terrifying minutes. With strict building codes already in place, most structures received only minor damages and no one was seriously injured. However, one building could not withstand the impact as the second floor collapsed during the earthquake, and consequently the majestic structure had to be demolished. 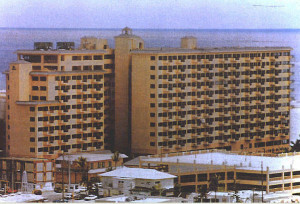 Today, only Royal Palm Resort’s parking garage remains in the middle of a bustling Tumon across the street from the San Vitores church. FACT: Guam is in a very unique location on a long belt of volcanic activity known as the Ring of Fire. These fissures in the ocean floor are hot spots that cause earthquakes as it runs around a perimeter spanning the entire Pacific Ocean. When Earth’s plates collide, they form mountains. The Mariana Archipelago is essentially underwater mountaintop islands formed 100-plus million years ago, and only have active volcanoes located on the northern chain. Our tiny island is perched at the edge of the Philippine plate which continues to move rising over the Pacific plate. 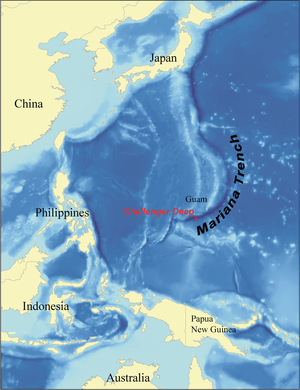 The Pacific plate continues to sink underneath the Philippine plate, causing the Marianas Trench to grow deeper. This movement, however, moves at the rate of 1 to 10 centimeters per year. The distance and depth of the trench despite our close proximity to a highly unstable area along Earth’s plates, fortunately, mollifies the intensity of daily earthquakes. We normally do not feel these tremors unless there is larger volcanic and plate tectonic activity. 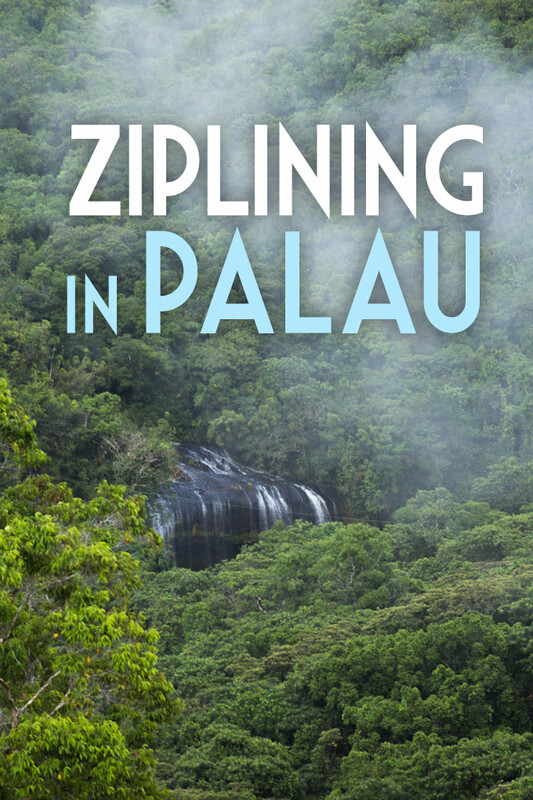 The deep southern roads of Guam wind and gently roll up and down the mountainous terrain. 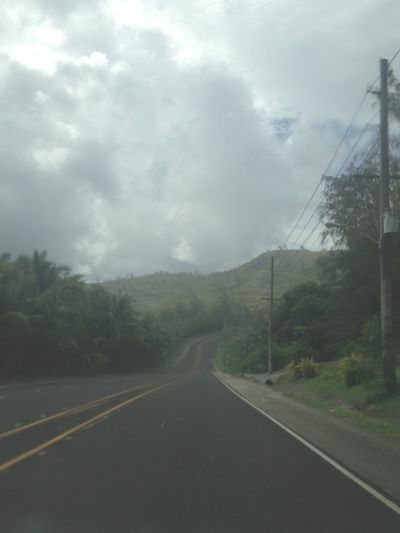 Somewhere in Umatac, a road has been traversed on then is strangely reversed on to test whether the car will roll back up the top of the hill. Some say it happens because the world’s tallest mountain (below sea level) is just around the corner, changing the area’s gravitational pull. Another theory is that there may be some secret military underground silo buried under a mountain, hiding top-secret gravity-altering technology or it may simply happen from the strong winds brushing against the grass-covered slopes onto the road. 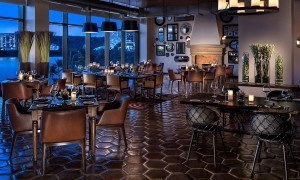 FACT: The slope of gravity hills are optical illusions. The rolling hills and the surrounding layout of the landscape produces the illusion that the surface may appear to be an uphill slope but is actually a slight downhill slope. Many hills much like this exist around the world and are turned into tourist attractions. They may be also known as magnetic hill, gravity road, mystery spot, or mystery hill. As for Guam’s gravity hill, the phenomenon has rarely worked as expected since the road was reconstructed. But in certain weather conditions, such as a windy and rainy day, it has been known to work. A piece of “hima” known in English as the Giant Clam (Tridacna gigas), is carefully carved out, polished into a glassy luster and made into a necklace lined with disks of the spondylus shells. The body ornament is called sinahi, which means “new moon.” The name is given by its carved crescent-shape curve. This token from the sea is also a reflection of the ancient people’s expert sea-faring skills, relying on celestial navigation to guide them along the vast ocean highways. 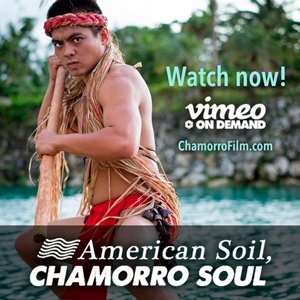 The revival of this body ornament was first re-introduced in modern times by influential Chamorro men like Ben “Sinahi” Del Rosario, a pioneer in carving one-of-a-kind shell jewelry pieces, and the late Angel Santos, Chamorro civil-rights activist-turned senator. 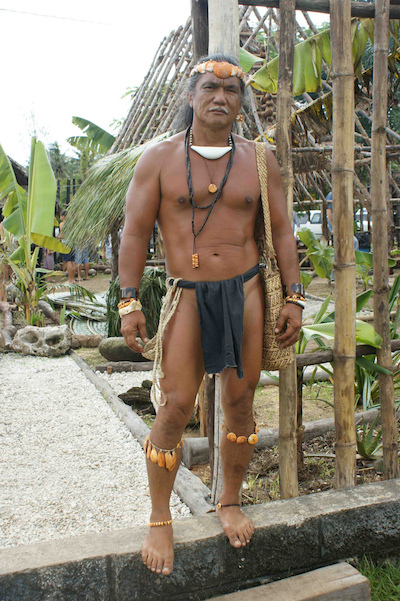 FACT: These pieces adorned only the ancient Chamorro chiefs, called Maga’lahi, according to historical accounts. 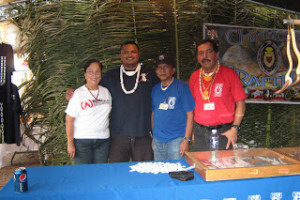 It has now become a coveted jewelry item sold in cultural fairs around the Pacific region and on several websites. The high value of these pieces recognizes the arduous task of retrieving giant clams and spondylus shells legally, and often at great ocean depths, and for a growing appreciation of refining a craftsmanship focused on recreating ancient replicas into exquisite, wearable works of art. In Guam, hard rain can pelt down on your windshield with just a few cumulus clouds and a bright hot sun out in the sky. A “sun shower” is what this meteorological phenomenon is called. It is not an official weather term, but the name has been used around the world associated with folklore. The theme shared in most stories is that during this phenomenon, an animal has given birth, is getting married or an unusual wedding between monkeys are taking place. Since sun showers happens almost every day on Guam then could this account for our large stray animal population? FACT: The scientific explanation is that it is more nature’s version of another optical illusion than nature’s way of announcing an even stranger event. Cumulus clouds are white, round and fluffy clouds that brings on fair weather, but in this case, a cumulus cloud is built up vertically. 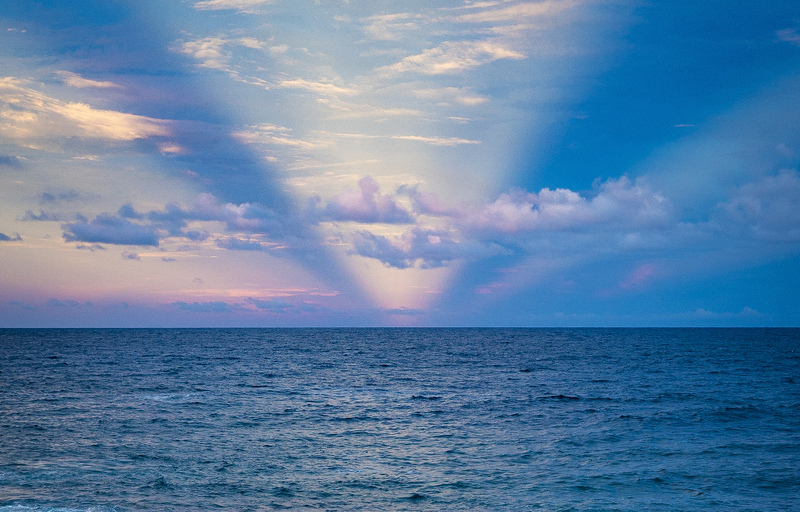 The tall cloud may be completely bypassed by the sun’s rays as it beams down at a certain angle. But the vertical cumulus cloud appears to be a smaller version of a cumulonimbus cloud, a towering dense cloud that brings on heavy rain. The combination of height and dense build-up causes rain to be dumped in an abrupt manner. 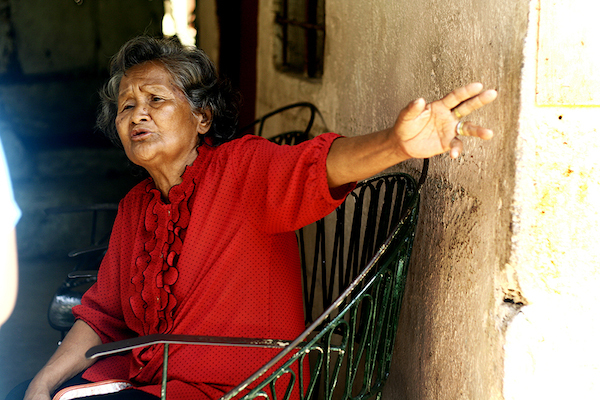 FICTION: Many older local residents, such as in the Filipino community, have their folktale versions of what sun showers are: a witch being born or getting married. Other places like Hawaii name the sun shower Ghost Rain. In Japan, a fox’s wedding ceremony is being held, while in Korea a male tiger is marrying a fox. In Tanzania a lioness has given birth, and the list goes on in many more other countries, especially India. Long ago, strange weather phenomena seemed fantastical, few and far between. We know now that extreme weather is an effect of climate change, not a joyous ceremony in the animal kingdom. 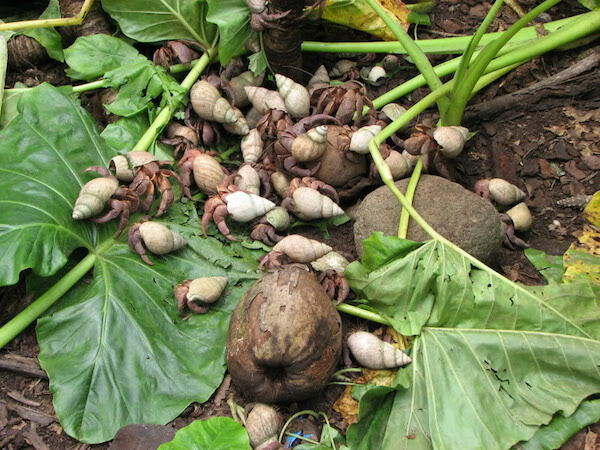 Locals fondly recall childhood experiences of having had the brief pleasure of making these notoriously elusive creatures, the hermit crab, their pets. A lone purple pincher hermit crab would wander into yards, and besides the African snail shell on their backs, bring with them an air of mystery. From where did they come? But more importantly, Where did they go? When a hermit crab was captured (before there were handy pet store containers with latches) the sizable crab was usually placed in a tall five-gallon paint bucket or the convenient deep laundry sinks in the garage. Before leaving it for the night, these novice pet crab-owners covered the container, usually with multipurpose plywood then weighed it down further by a hollow block (or two) to keep the one crab from escaping. The next morning, with everything still in place and still intact, upon removing the plywood lid, they discovered that the crab that supposedly spent the night in a secured container had simply vanished. FACT: These intelligent creatures have the capacity to devise a plan and engineer an escape, usually through the use of their strong claws and legs. If there were any objects inside the container it would be used as a stepping stool first, then afterwards, they would outstretch their limbs to reach another point where they could latch on with their legs, which have tiny talon-like ends. Those same sharp ends can find tiny grooves on a seemingly smooth structure to climb on, or the crab can gravitate to a corner to use the angle as leverage on the way up. Once they reach the closed top, they can wedge the sharp end of their leg underneath the lid then use their (house-carrying, coconut-husking) immense strength to lift it enough to escape back to freedom. The brown tree snakes were responsible for causing over 1,200 power outages dating back to 1978, according to research reported from Columbia University. It is hard to believe that the entire island can be plunged into utter darkness by one slithery and slender interloper. The snakes’ attempts to cross electrical lines for shelter on high and dry ground in rainy weather produced massive damage with power surges and ended fatally for the snake. This created economic havoc when the need arose to replace expensive power station equipment and when many households experienced widespread electrical fuse blow-outs on home appliances. This prompted the purchase of surge protectors to better prepare for a period of load-shedding blues, scheduled isolated power outages for years to come. 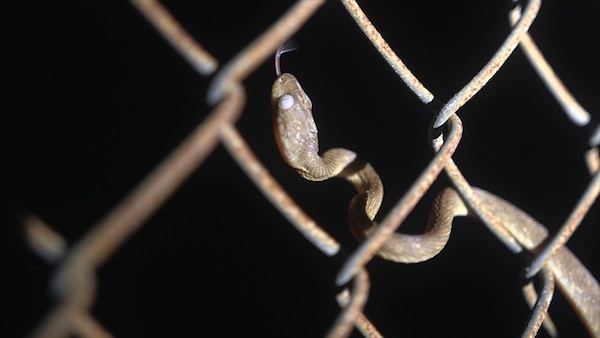 FACT: The brown tree snake has never eaten a baby as the tabloid media previously reported, nor are the sensationalized reports true about the streets of Guam covered with millions of these cold-blooded creatures. 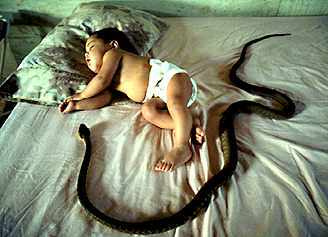 There are occasions when these mildly venomous snakes have bitten babies, mostly on their arms, requiring treatment for skin inflammation. Recent data has shown a decline in snake population when compared to data taken in the ’80s. Since the snakes had no real predators and competition with other organisms, they were able to wipe out several bird and lizard populations resulting in the decrease of their food supply, leaving only each other to compete against. The government continues to take active measures to control the population and to secure locations at high risk where snakes may adversely affect the environment and economy. Recently the media has been buzzing again about the snake-overtaking-Guam story. Many reports make mention of “dead mice” and “dropping poison pills,” but scientific journals clarify that this aggressive method of eradication will be dropping a total of 30,000 live mice carrying acetaminophen onto a secure federal property with dense snake population. Data is currently being collected to determine whether results will prove successful or not. Did you answer all the questions correctly? Are there things you still find hard to believe? The island is as mysterious as it is exotic, but one who is the curious type, bent on digging deep down, all the way to the root of things, may find that the answers are explained by the simple and wonderfully logical world of science. But with all this strangeness going on, it’s quite entertaining to be on an island filled with intrigue in the middle of nowhere.